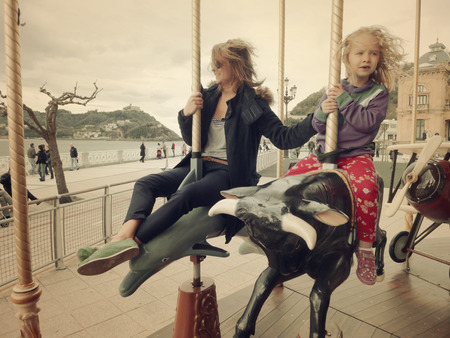 San Sebastián's carousel (or tio vivo in Spanish, which literally translates to living uncle) is an arte nouveau beauty perched right on La Concha beach in front of the town hall. In the park Alderdi Eder, this thing runs rain or shine. When they tore up the plaza a year or two ago, they transported the whole carousel so it could continue to be used. It's a Belle Epoque Art Nouveau beauty, and Buckley's watchful eye recently noted the addition of the bull to the lineup of moving pieces. A concession to Spanish-ness or a mere replacement for a broken dolphin?